Fit 750 mL - 1L bottle such as Champagne, Water Bottles, Liquor Bottles, Glass Bottles, and much more! Not only a tote bag but also a cooler keeper holder which can keeps your drink cool longer while you watch the game, party with friends, go out on any outdoor activities. Ideal gift for your friends and party hostess in the coming Thanksgiving Day and Christmas! Perfect for various BYO events, Christmas, New Year's Eve, Birthday Parties, BBQ's, Family Picnic's, Camping, Bon Fire's, Bachelor and Bachelorette Party's, Bridal Shower, Block Parties, Dance Parties and Mixers, Graduation Parties, Mother's Day, Housewarming Gift, Dinner party, etc. You can find one of the above reasons to make an order of LAGUTE! ✔ COOLER KEEPER FOR WINE: Keeps any standard 750ml-1L bottle (wine, liquor, sports drink, milk) cool for a longer time, insulated and makes you comfortable to hold. A good option for keeping an already chilled wine cold. ✔ PROTECTIVE TOTE BAG CARRIER: Each tote bag is carefully zig-zag stitched by the side seams which prevents your wine from breakage, bumps, and bouncing while in transport. ✔ LIGHTWEIGHT & COLLAPSIBLE: LAGUTE lightweight but sturdy and flexible wine tote is made of Neoprene material. 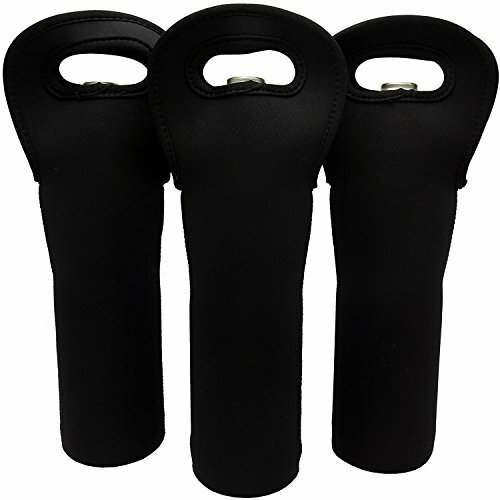 Collapsible but not stand-alone type wine/bottle sleeve saves the space and is convenient for carrying. ✔ BLANK DESIGN FOR CREATIVE IDEAS: Solid black for personalizing your totes, using waterproof markers, adding details using hot glue, or decorating with heat transfer vainly, which inspires your infinite imagination. ✔ GREAT GIFT or EVENT & PARTY SUPPLIES: Perfect for various BYO events and also can be Christmas gift, Thanksgiving gift, Birthday gift, housewarming gift, hostess gift, etc. Perfect for all kinds of parties and gatherings.